I know it's Monday already. But, I'm showing off the socks I finished on Sunday, so that I can cast on for my next pair of socks, "Sunday Swing". And I wanted to show you my new favorite pattern by Carol Sunday. Now I have my US 1 needles free for the next pair of socks which will be Sunday Swing, by Krystel Nyberg, from the Summer 2009 Knitty. I like how Grumperina's version of this pattern came out, and plan on using her modifications. Angie and I are going to have our own mini-knit-along. Does anyone else want to join in? The new Twist Collective is up. I've just had a chance to skim over the new patterns and so far my favorite is this sweater. 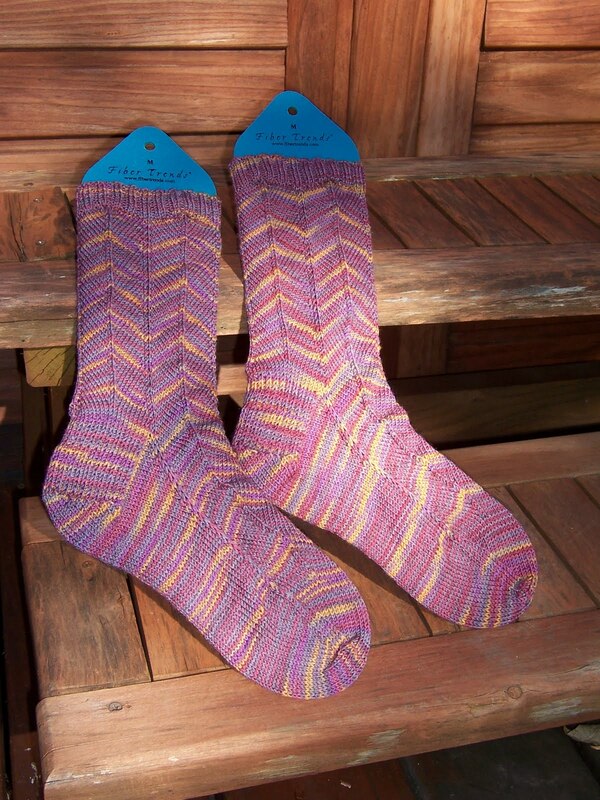 The pattern, by Carol Sunday of Sunday Knits, is written for yarn from her own line of yarns. Each of her 4 yarns comes in the same 2 weights, so they are interchangeable in her patterns, and they come in a beautiful range of colors. Last year I knit her Sunday Scarf. She provided great customer service when I bought the kit from her, and her pattern was well written. I have a feeling Kelmscott will be jumping ahead of some other items in my Ravelry queue. I'm still working on yarn dyeing with the mushrooms. More about that tomorrow. Love the way the LL colorway turned out with those socks! I ABSOLUTELY love the Kelmscott pattern - A perfect opportunity to do bobbles ;) I'm ready for the socks too! Please join us, knitters!